Supreme Court 2015: King v. Burwell and Kimble v. Marvel Entertainment. A chief justice has a greater personal interest in how he votes than the other justices. 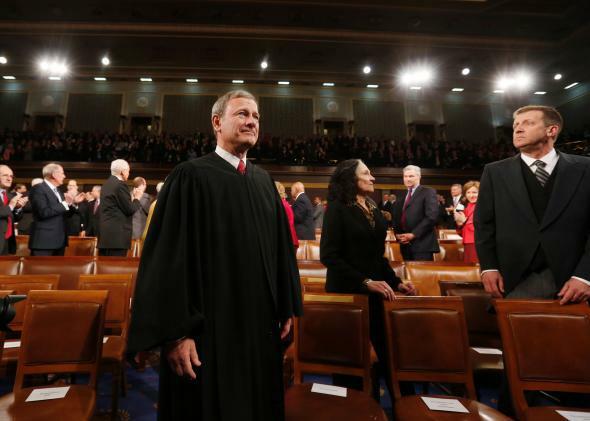 Chief Justice John Roberts arrives prior to President Obama’s State of the Union speech on Capitol Hill on Jan. 28, 2014, in Washington. One rarely can be certain about what moved a judge to vote as he or she did in a particular case, especially if the judge is the chief justice of the United States and the case has momentous practical significance, as is true of King v. Burwell. The use of terms like Warren court or Rehnquist court or Roberts court reflects the tendency to make the chief justice the personification of the court. Had King been decided against the Affordable Care Act, it would have been thought, depending on one’s politics, a success or a failure of the Roberts court, whichever way he voted. Had he voted against the act and been the deciding vote (maybe if he had voted against it, Justice Anthony Kennedy would have joined him, delivering victory to King), he would have been vilified—possibly by Republicans as well as by Democrats. Thus I am suggesting that a chief justice has a greater personal interest in how he votes than the other justices. A great deal of legal doctrine is spongy, creating a wide field for the exercise of judicial discretion. The interpretation of statutes is an example. Interpretation is a natural human act, but it is intuitive, and trying to bound it by rules, though a natural ambition of lawyers and judges, has always failed. A question of statutory interpretation that gets as far as an appellate court is generally a question that the legislature did not anticipate when it adopted the statute. The judicial role in such a case is not interpretation but completion. Which is the character of the chief justice’s opinion in the King case. The sheer length of the Affordable Care Act—2,700 pages (the longest statute I’ve ever heard of)—made it inevitable that there would be mistakes and omissions. The mistake in this case was threatening the health benefits of more than 6 million Americans. No reason could be imagined for Congress’ wanting to produce that result. Pragmatic, common-sense completion of defective statutory language concerning “exchanges” was both a sensible approach and a way of avoiding public anger, likely to be directed at the Supreme Court (and primarily at the chief justice), and secondarily at Republicans, ferocious enemies of the act, and directed at Congress, too, if it proved unable to patch up the act if the court refused to do so; and both houses of Congress are controlled by the Republicans. Justice Antonin Scalia’s dissent can be summed up in four words: “fiat justitia, ruat coelum,” which means, roughly, do justice even if doing justice causes the heavens to fall. In other words, sever legal analysis from consequences however great. That is a dangerous approach to law, and to government generally. Legal doctrine should in my view be shaped with careful regard for consequences, especially where doctrine is flexible, as in the case of statutory interpretation. Kimble v. Marvel Entertainment, LLC, in contrast to King, was a very bad decision. A half-century ago, in a case called Brulotte v. Thys (1964), the Supreme Court held that a patentee cannot make a contract with a licensee of the patentee’s patent that requires the licensee to pay royalties to the patentee after the patent expires. The court thought that enforcement of such a contract would extend the patent monopoly beyond the statutory term (usually 20 years). That doesn’t make any sense. When the patent expires, anyone can make the patented product or process without compensating the patentee. The licensee who had agreed to pay post-expiration royalties is not compensating the licensee for being allowed to make the patented product or process—he is paying the deferred portion of the fee for his license to use the patented item before the patent expired. Such deferral may benefit the licensee by spreading the costs of the license, and the patentee by attracting licensees who would find the costs excessive if squeezed into the patent period. After the patent expires, anyone can make the patented process or product without being guilty of patent infringement. The patent can no longer be used to exclude anybody from such production. Expiration thus accomplishes what it is supposed to accomplish. For a licensee in accordance with a provision in the license agreement to go on paying royalties after the patent expires does not extend the duration of the patent either technically or practically, because, as this case demonstrates, if the licensee agrees to continue paying royalties after the patent expires the royalty rate will be lower. The duration of the patent fixes the limit of the patentee’s power to extract royalties; it is a detail whether he extracts them at a higher rate over a shorter period of time or a lower rate over a longer period of time.” Scheiber v. Dolby Laboratories, Inc., 293 F.3d 1014, 1017 (7th Cir. 2002). We noted also (as did Justice Samuel Alito’s dissent in Kimble) that it would be one thing if “Brulotte had been based on a interpretation of the patent clause of the Constitution, or of the patent statute or any other statute; but it seems rather to have been a free-floating product of a misplaced fear of monopoly … that was not even tied to one of the antitrust statutes.” Id. at 1018. Justice Elena Kagan’s majority opinion is a veritable paean to stare decisis, which means adhering to precedent. When a half century–old precedent is demonstrably erroneous, and has not generated substantial reliance interests, and doesn’t even have a constitutional or statutory pedigree but is purely judge-created, the refusal to overrule it is mere antiquarianism. I am sure Kagan does not believe that the Supreme Court is infallible, that it can look a half-century ahead, or more, and determine whether the decision it renders today will fit the conditions of that future period. But I can’t think of an alternative basis for the Kimble decision. It strikes me as irrational. Read the previous entry, by Dahlia Lithwick. Read the next entry, by Mark Joseph Stern.